I have a fresh install of Windows 8.1. I installed a program 'RackAFX' but it just won't start. I double click the icon and nothing happens. I have already installed BOTH the x86 and x64 re-distributables, as mentioned on the RackAFX download page. I tried all possible 'compatibility' options too and running as administrator but it still won't open. 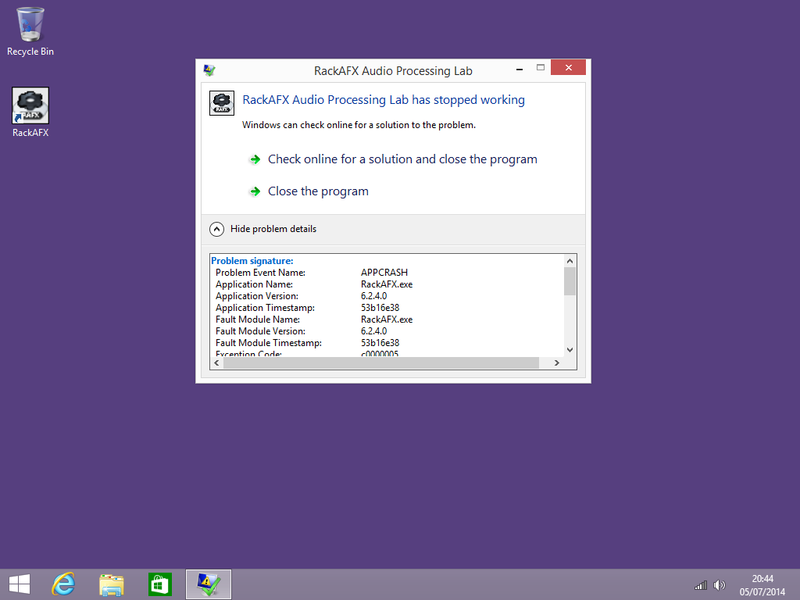 Now Windows doesn't even give the 'RackAFX has stopped working'. A double click results in a spinning circle near the mouse and then nothing. Anyway, trying to debug I installed RackAFX on both my wife's Windows 8.1 machine and my old clogged up Windows 7 partition (on the same machine as the problematic partition) and it works no problem. I also tried updating Windows 8.1 on the new partition but it still doesn't work. I then also added another Windows 7 partition to my new hard drive and installed RackAFX but same thing - it won't open. 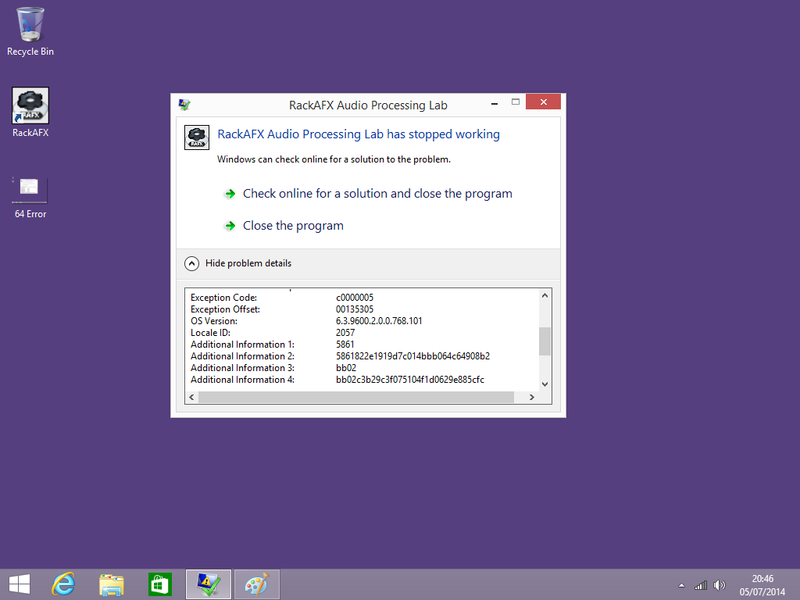 So, in summary, RackAFX won't open on a freshly installed Windows 7 or Windows 8.1. You are probably missing one or more for the MS VC redistributables. 32-Bit Operating Systems If you are not using VisualStudio 2008 and you are installing for the first time please also download and install the VS2008 C++ Redistributable x86 (it’s easy, quick and free). If you are going to use VS2008 then you don’t need the Redistributable as it will be installed automatically by VS2008. 64-Bit Operating Systems If you are installing for the first time please also download and install the VS2008 C++ Redistributable x64 (it’s easy, quick and free). You still need this, even if you are planning on using VS2008. UPDATE: A book reader who is using Win8/64-bit and Visual Studio 2013 reports that you need to install BOTH the x86 and x64 re-distributables. This is because VS2013 no longer installs some of the required files. The problem was that the driver for my soundcard hadn't yet been installed and so no default in/out device was selected. This caused the program to crash. Installing the driver and choosing an in/out resolved the issue. Not the answer you're looking for? Browse other questions tagged windows-7 windows windows-8 or ask your own question. How do I mount the EFI partition on Windows 8.1 so that it is readable and writeable? Can I install my copy of Windows 8.1 on a different PC (deactivate the first installation)? How to open and modify Group Policy settings in Windows 8.1? Upgrade Windows 7 to Windows 8.1, could something go wrong?